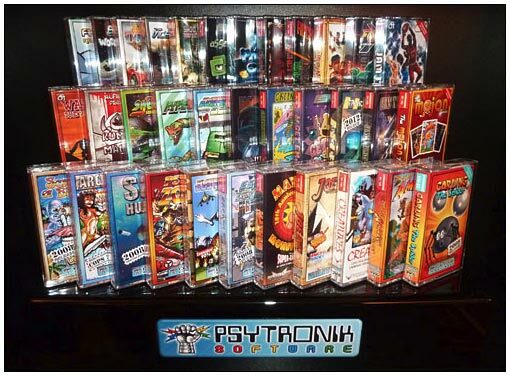 Psytronik Software - The software label devoted to releasing new games for classic computer systems! Established in 1990 we pride ourselves on publishing quality releases for retro computer systems presented in high quality packaging. A visually stunning arcade platform adventure for the Expanded Commodore C16 and standard Commodore Plus/4 computers! Battle against the mysterious Time Lords inside the Dungeon in this gripping RPG for the VIC20. Explore an ancient pyramid in this exciting arcade adventure for the Commodore 64! Defend the Omikron System in this stunning polygon-based 3D shoot 'em up! Amazing intergalactic golf simulator for the Commodore 64! Help Orangeman escape from the falling caves before he is squished in this fun game for the Commodore 64! Chomp your way through four huge worlds in this stylish platformer for the C64! Help Captain Steve Zappa destroy the alien intruders in this cool platform game for the Commodore 64! Dazzling neon-glow arcade shoot 'em up action for the PC! Hunt down the crime lord El Guato in this exciting cop chase action game for the Commodore 64! Help Buzzy Bee collect pollen from 16 levels - but be careful to avoid natural hazards and rampaging wildlife! Take on the alien hordes from the planet Darx in this slick shooter for the Commodore 64! 25 levels of aquatic shooting action for the Commodore 64! An epic arcade adventure for the C64. The power to save civilization is in YOUR hands!